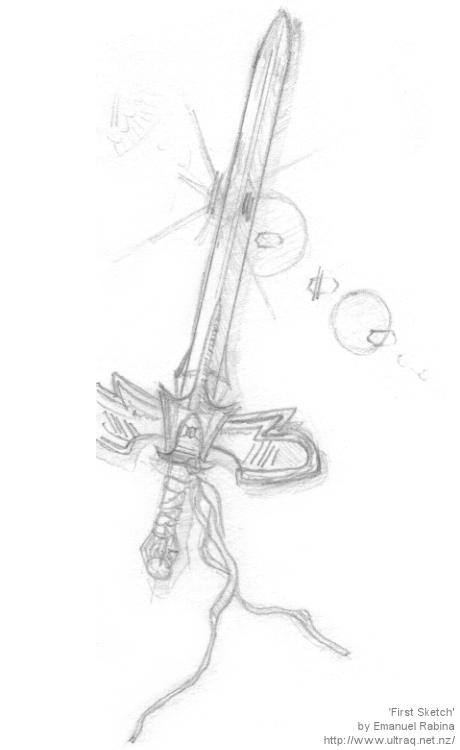 This is one of my first complete sketches of what I thought Atma Weapon (from Final Fantasy VI) would look like. The idea was completely original, or so I thought. Now that it's complete, I look at it and I can see elements of the design from other games, like Zelda 2: The Adventure of Link and maybe even both Lunar: Silver Star Story and Lunar 2: Eternal Blue. Either way, I'm proud of the finished product. Oh yeah, see where the hilt cuts off at the left? That's just where my paper ran out!